Dread Your Merit Spreadsheets? We Hear You! And you’re not alone. A study out of Loyola University Chicago found that 40.1% of US-based companies use spreadsheets to manage their annual merit cycles and bonus processes. When we dug deeper, we found that there was a technology gap a mile wide. So… with 30 years of HR Compensation Management experience, we decided to do something about it. And that something is SimplyMerit®! We are an ideal blend of industry expert advisors and visionary designers working closely with an inspirational team of developers committed to delivering excellence in merit pay and bonus compensation management software solutions. 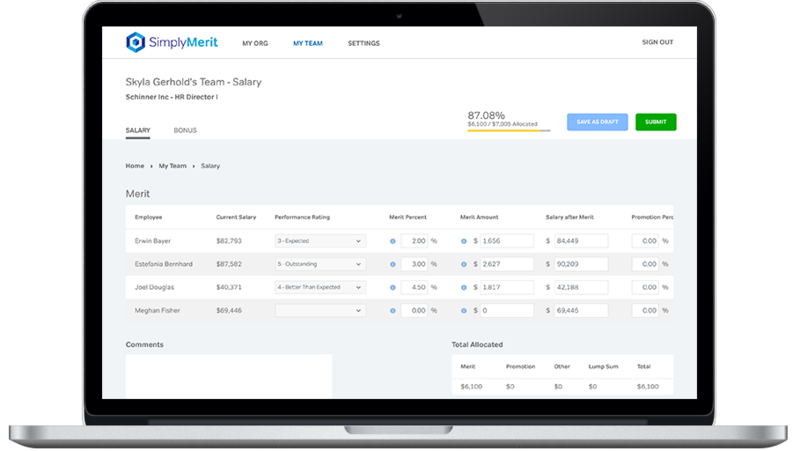 Our first solution, SimplyMerit, delivers a simple and elegant annual merit pay and bonus allocation experience for both HR and business managers.